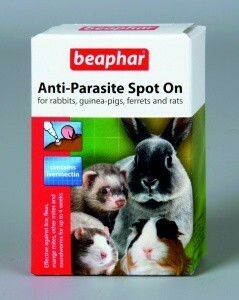 Details: Beaphar Anti-Parasite Spot on for Rabbits, Guinea Pigs, Ferrets and Rats. Effective against lice, mange mites, other mites and roundworms, for up to 4 weeks. Contains Ivermectine, 150ug per pipette.